The upcoming month...or two or three...will be immensely busy for me as new responsibilities are entering my life, but I have SO many post ideas and recipes to share (and a ridiculous amount of food pictures that are crying to be uploaded), so I need to find the time to document them all! Blah, blah...mini life-update over...let's get to the good stuff: PUMPKIN WAFFLES. As hinted by my previous blog posts, I had been anticipating Fall for awhile...and now Fall is finally here! Golden, burgundy leaves dappled on the trees; crisp, chilly air encompassing our cheeks; chunky sweaters and blankets keeping us snug; hearty squashes of all sorts picked fresh from our garden harvests - everything about this season is just so cozy! I don't know about you, but this colder weather has been making me crave heartier foods and meals (and ridiculous amounts of coffee throughout the day) - perhaps I'm taking note from our intelligent, furry little friends outside and am preparing for the colder months ahead by thickening up my "coat" ;). Oh well, a little, healthy thickness is OKAY people if done in a healthy manner, of course. For a filling, hearty breakfast this morning, I had half a scrambled egg for some good healthy fats, small slices of Canadian bacon...for good flavor, blackberries, and drum roll please....RRRRRRRRRRRRRRRRRRRRRRR (what an angelic sounding drum, I know)...Pumpkin Whole Wheat Waffles with an Maple Apple and Pecan Topping. Can you possibly get any more Fall than that? The recipe for this waffle batter uses entirely healthy ingredients; is low calorie at only around 125 calories for a relatively big, good size waffle (none of those minute, cracker size waffles here...I'm dang hungry in the morning and eat more than a bird thank-you-very-much) minus the apple topping, which only adds negligible healthy calories (I made five bigger waffles out of this batch); is low in sugar with only a hint of pure maple syrup and natural sugar from the apples; and is low in fat! Typically, I am not a fan of whole wheat flour...I try to use it, but the taste just doesn't seem "right" or satisfying to me. 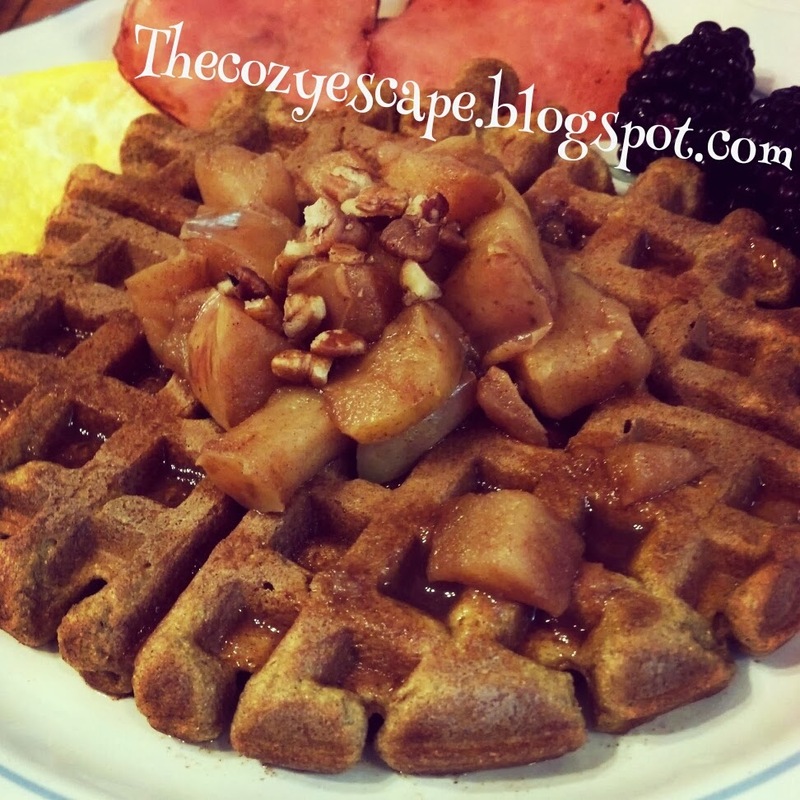 However, mixed with the flavors in this yum, yum, yummy waffle recipe, the whole wheat flour adds a nice, nutty-ish flavor! Even my mother, who despises whole wheat flour and is not a fan of pumpkin, LOVED this recipe, so give it a try! In a large bowl, combine the flour, baking powder, cinnamon, clove, nutmeg, salt, and ginger (essentially all of the dry ingredients) together until nicely mixed. Create a "cave" in the center of the dry ingredients. In another bowl, whisk together the egg, apple sauce, almond milk, pumpkin puree, vanilla extract, and maple syrup. Then, pour the wet ingredients into the center of the dry ingredients and mix until the dry ingredients are moistened and everything is evenly combined and relatively clump free. Once the waffle maker is heated, pour the waffle batter into the maker. I scooped a full, large ladle of batter for each waffle. Let each waffle cook for about 5 minutes. The waffles will feel a tad crispy when you first remove them, but as they sit, they become SO fluffy and soft! While the waffles are cooking, place the apple cubes into a small pot. Pour just enough cold water in so that the water covers the bottom of the lowest layer of apples. Then, add the maple syrup and generously sprinkle on some cinnamon. Stir everything together, cover, and heat the apple mixture on medium-low heat. I continued to heat the apple mixture until all of the waffles finished cooking. The apples softened and the liquid "thickened" a little, but I removed it from the heat before everything became "mush"; I still had nice chunks of apple.